This Otter sculpture was created for a development by Knightstone Housing at Kings College in Taunton. There was very little in the way of a brief for this project which simply required a focal scultpture feature for the development. Various ideas were sketched out for the client to consider as a basis to work from. As it was to be a mixed development, an animal theme was decided upon to appeal across the age range. The architect mentioned that there were otters in a nearby river which would provide a good link to the local environment. 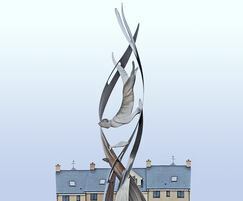 The final sculpture design was on an otter swimming down through the water. 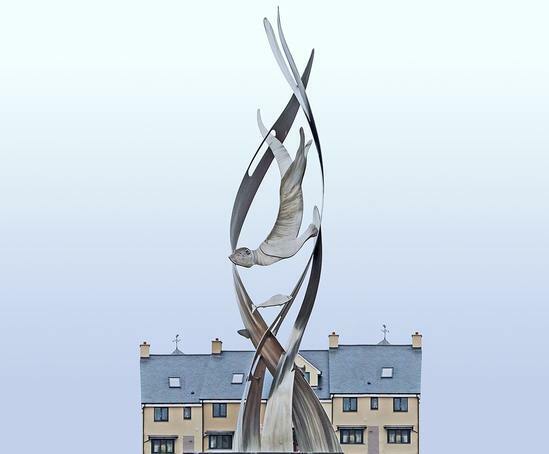 The sculpture is made in marine grade stainless steel and is 2 metres tall and sits on a brick plinth 900 x 400 x 400..